MARYVILLE, Tenn. – Mar. 23, 2016 – After the record-setting Tennessee Tipoff Classic on March 12, the Smoky Mountain Speedway will get back to action on Saturday April 2nd hosting the Ultimate Super Late Model Series for a $5,000-to-win event. The Ultimate Super Late Model Series will take on the Ultimate Battle of the Bluegrass Series in a 40-lap $5,000-to-win race. Along with the Super Late Models, The United Crate Racing Alliance (UCRA) tour will be on hand paying $2,500-to-win and the Street Stocks will also race for $500-to-win. Casey Roberts of Toccoa, Ga. is the defending Ultimate Super Late Model Series champion. Randy Weaver of Crossville, Tenn. is a three-time Ultimate series winner at Smoky Mountain with two victories in 2015 and one victory in 2014. Dillon Wood of Daytona Beach, Fla. won in 2013 while Vic Hill of Mosheim, Tenn. and Ray Cook of Brasstown, N.C. took victories in 2012. The pits will open on April 2nd at 2:00 pm, while the grandstand and tier parking gates open at 4:00 pm, and the driver’s meeting is set for 6:30 pm and hot laps will roll out around 7:00 pm. Adult general admission for the April 2nd event will be $20.00. Adult tier parking is $25.00 per person and adult pit passes are $35.00. Scott Bloomquist of Mooresburg, Tenn. captured the Old Man’s Garage Spring Nationals Series-sanctioned Tennessee Tipoff Classic presented by Hard Rock Café of Pigeon Forge on March 12thwhich paid the Hall of Famer $15,000 for his efforts. Michael Courtney won the Sportsman Feature on Friday March 11th that paid $2,000 while Robbie Comer claimed the Street Stock feature event win on March 12th which paid $2,000-to-win. MARYVILLE, Tenn. – Mar. 12, 2016 – Scott Bloomquist of Mooresburg, Tenn. rolled to his first-career Old Man’s Garage Spring Nationals Series victory while also becoming the 17th different tour winner on Saturday Night during the Tennessee Tipoff Classic presented by Hard Rock Café of Pigeon Forge at the Smoky Mountain Speedway. Bloomquist and pole-sitter Randy Weaver swapped the lead multiple times during the mid-race point of the 75-lapper with Bloomquist going on to win the $15,000 first place prize. Bloomquist drove the Reece Monuments, Mark Martin Automotive, Crop Production Services, Dyna-Gro, Allstar Performance, Sorbea Chiropractic, Horton Oil, Base Race Fuels, Hawkeye Trucking, Hoosier Racing Tire, Lucas Oil Products, Ole Smoky Moonshine, Penske Shocks, Sweet Manufacturing and Wels Wheels-sponsored Andy Durham Racing Engines-powered Sweet-Bloomquist Race Cars to the victory. Three caution flags slowed the event. On lap 38, an inadvertent caution came out, on lap 58 the next yellow came out as Tommy Kerr stopped in turn four and the final yellow flew on lap 39 as Robby Moses slowed on the front-chute with a right-front flat tire. 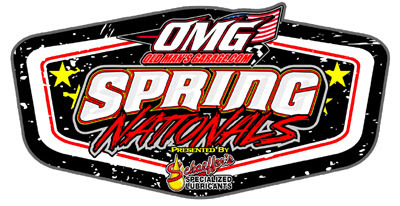 The next Old Man’s Garage Spring Nationals Series by Schaeffer’s Oil events are on Friday March 25 and Saturday March 26 at Senoia (Ga.) Raceway paying $4,000-to-win and $6,000-to-win respectively. 10. Earl Pearson Jr.-Jacksonville, Fla.
Heat-One Finish: Randy Weaver, Darrell Lanigan, Shanon Buckingham, Vic Hill, Cory Hedgecock, David Payne, Stacy Boles. Heat-Two Finish: Joey Coulter, Dale McDowell, Robby Moses, Ryan King, Tommy Kerr, Bobby Giffin, Kyle Pierce. Heat-Three Finish: Scott Bloomquist, Jared Landers, Jimmy Owens, Jason Welshan, Mack McCarter, Mark Douglas, Chris Madden (DQ’ed). Heat-Four Finish: Mike Marlar, Donald McIntosh, Earl Pearson Jr., Don O’Neal, Greg Johnson, Steve Smith. Consolation Race Finish: Cory Hedgecock, Tommy Kerr, Greg Johnson, David Payne, Bobby Giffin, Stacy Boles, Kyle Pierce, Mack McCarter, Steve Smith (DNS), Mark Douglas (DNS). MARYVILLE, Tenn. – Mar. 11, 2016 – The Old Man’s Garage Spring Nationals Series presented by Schaeffer’s Oil opened up the Tennessee Tipoff Classic presented by Hard Rock Café of Pigeon Forge with preliminary raceson Friday night at Smoky Mountain Speedway. Randy Weaver of Crossville, Tenn. captured the First Heat race, Joey Coulter of Concord, N.C. was victorious in the Second Heat while Scott Bloomquist of Mooresburg, Tenn. went on to take the win in Heat Three and Mike Marlar of Winfield, Tenn. won the Fourth Heat race. Scott Bloomquist was the fastest qualifier of the stout field of 27 entries with a 14.901 second lap. Saturday’s program continues with a full show for the Street Stocks ($2,000-to-win) and the Last Chance race and 75 lap $15,000-to-win Tennessee Tipoff Classic finale. The driver’s meeting is set for 6:30 pm tonight and hot laps will roll out around 7:00 pm. Heat-One Finish: Randy Weaver, Darrell Lanigan, Shanon Buckingham, Vic Hill, Cory Hedgec0ck, David Payne, Stacy Boles. Row-6: Robby Moses and Earl Pearson Jr.